We must cherish the earth we still have – An art installation with food for thought. 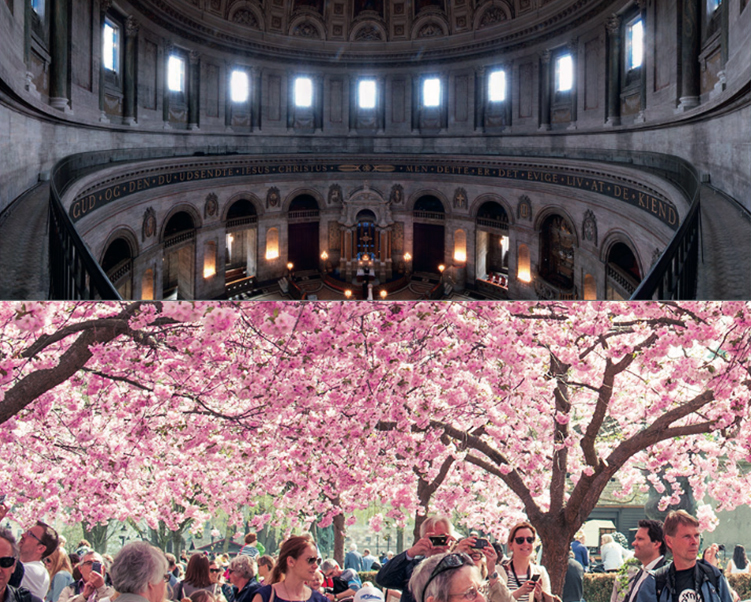 In 2018 citizens and guests of Copenhagen could dream themselves away under a sky of thousands pink cherry blossoms inside the city’s Marble Church. The sky was a part of the exhibition Cherish, made in collaboration between artist Veronica Hodges, the church and Morten Meldgaard (Associate Professor at the Institute of Architecture, Urbanism and Landscape at The Royal Danish Academy of Fine Arts Schools of Architecture, Design and Conservation). The exhibition was inspired by the effect of climate change on the seasons and the culture, that has been inspired by the seasons through time. With an installation made of 15.000 cherry blossoms folded in crepe paper, Hodges reminded the exhibition visitors to appreciate nature. Her wish was to inspire people to reflect on what we each can to to protect the world. By letting the cherry blossoms – a symbol of spring – take over the church during autumn, Hodges merged the natural and man-made world. The exhibition became a reminder of the fact that nature is a beautiful and important part of our lives that we must, in fact, cherish. The dream of creating a sky of flowers became reality with indispensable help from volunteers from the community, local institutions and schools. Adults, youth and children came together to make the individual flowers by hand. Through this tangible activity, a community emerged. Here, people could come together to make a difference, no their matter age, background or faith. The project is based on the climate changes and their influence on our seasons and the culture that the seasons have created over time, such as through ecclesiastical actions and the hymn’s century-long poetry. We are based on the UN’s 17 global goals for a better world, the so-called Sustainable Development Goals (SDG). The 17 goals reflect a common and humanistic vision of humanity and the planet we inhabit. The idea of ​​the project is that we must change ourselves before we can change the world. We must change our thinking pathways, our behavior and our patterns of consumption and take responsibility for ourselves and our actions.